In 1830, he joined the newly-refounded Wallachian Army as a member of its officer corps. Three years later, Bolliac became a member of the secret Philharmonic Society, created by Ion Campineanu, Radulescu, and Constantin Aristia. In 1835, he published his first lyrical works. A year later, he began editing the review Curiosul. With fellow radicals Nicolae Balcescu and Eftimie Murgu, Bolliac joined in Mitica Filipescu's conspiracy against Prince Alexandru II Ghica and, later in the year, entered the Freemasonry-inspired Fratia ("Brotherhood") secret society. "The times of Petrarch are over, gentlemen poets! The century demands progress, propaganda for the great idea, propaganda for the true charity that we lack entirely. (...) Form societies, declare, write down, praise, satirise, start working with all intellectual and moral devices, and the enslavement shall crumble, for it is half-crumbled, and you gentlemen shall be given the blessings of future generations as true apostles of the heavenly mission, of brotherhood and freedom." In an article he published in 1846 in the pages of the same magazine, Bolliac showed his admiration for the works and attitues of Victor Hugo, which he recommended as a guide to Wallachian writers. Consequently, he was one of the leaders of the 1848 Wallachian revolution, and took exile after the Ottoman-Russian intervention in September. In Brasov, Transylvania (on Austrian domain), Bolliac began publishing Espatriatul, a paper which featured the subtitle Dreptate, Fratie ("Justice, Brotherhood"), a rendition of the revolutionary slogan. After 1857, he settled in Paris, and published the French-language poem Domnul Tudor. Episode de la révolution roumaine de 1821 ("Voivode Tudor. An Episode of the 1821 Romanian Revolution"), and began issuing his review Buciumul, a mainly political magazine. He returned to Wallachia in 1858, after the Crimean War had led to a drastic decrease in Russian influence (allowing for radicals to regin their country), and took an archaeological study trip. 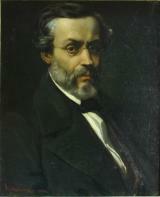 He included the results of his investigations in Buciumul and its successor Trompeta Carpatilor (he began editing the latter in 1865). During the period, Bolliac also engaged in activism in favor of Wallachia's union with Moldavia, a goal reached under Alexander John Cuza. He later became a notorious antisemite, rejected the idea of naturalization for the Jews, and engaged in a polemic over this issue (and that of his version of Romanticism in general) with Junimea's Titu Maiorescu. He died in Bucharest, by then the capital of the Kingdom of Romania.